We want to examine artists who have been disabled, artists who have featured disabled people through a social model lens but also to understand the attitudes existing at different times over history. Visit our Artists and Disability page for profiles of many individual artists. We have made 2 powerpoints on this year’s theme, for use in assemblies. Video footage, and accompanying materials used at the Launch of UKDHM 2017, at Portcullis House, Parliament. 22 November 2017. Given by Richard Rieser. All info in the presentation is elaborated on in the 2017 broadsheet. 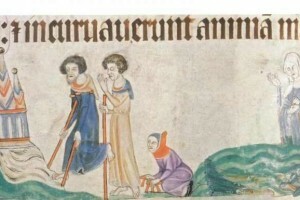 a) the representation of disabled people across time and culture. b) artists who were themselves disabled. 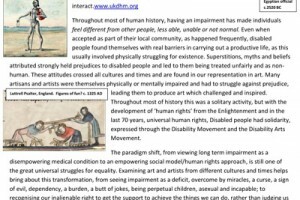 c) with National Disability Arts Collection and Archive (NDACA) the history of the Disability Arts Movement, which has sought since 1970s to promote the work of disabled artists and to challenge the oppression disabled people continue to face. 12 page illustrated analysis providing essential background for teachers. This examines our three themes with a largely European perspective from ancient cultures to the present day. Casualties from Sierra Leone’s civil war find a new horizon through art. 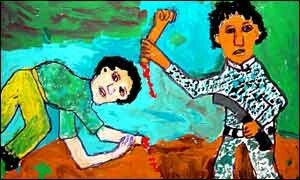 Four animations produced by the National Disability Arts Collection and Archive in collaboration with UKDHM.